Turkey, often the staple of family & holiday gatherings the world over, need not be the hassle that the term “turkey dinner” may bring to mind. No all-day oven bakes, no risky turkey deep fryers. No overcooked cardboard turkey meat. Turkey shouldn’t have to be drenched in gravy to be edible. Juicy breast meat (yes, believe us, it’s very possible and very easy), crispy skin, and juicy-yet-not-slimy leg and thigh meat. With your kettle grill and two-zone cooking (the Slow ’N Sear makes it set-it-and-forget-it) you can easily have the most perfect tasting turkey you’ve ever made. And you don’t even have to smoke it, but you sure can if you choose to. 2) Practice on a whole chicken if you haven’t already. Chickens are relatively inexpensive and oh so delicious when done properly. 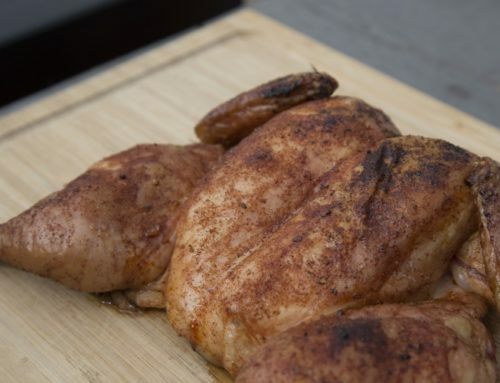 To see our whole chicken technique page, click here. 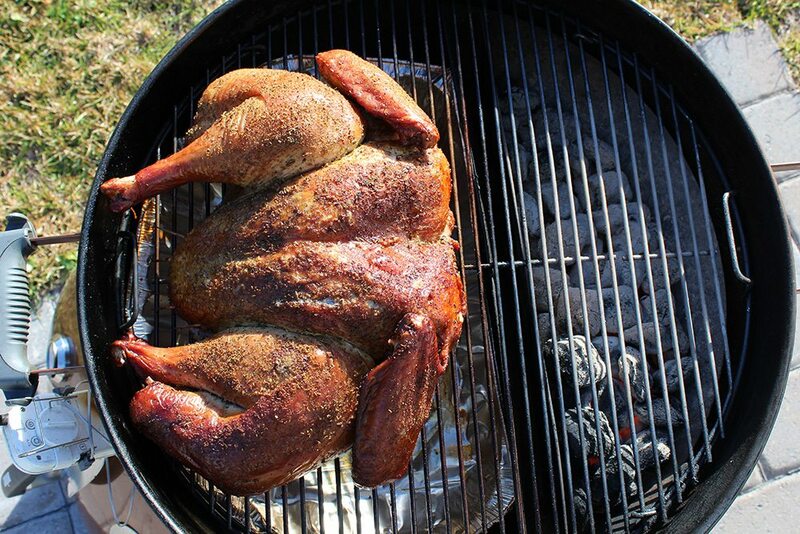 To begin with, we’ll refer you to the outdoor cooking encyclopedia that is AmazingRibs.com and let you soak up some ‘knowledge gravy’ on Meathead’s Ultimate Turkey page. Here you’ll learn how big of a turkey to select for your dinner, how long and how best to thaw a frozen turkey, how to prep the turkey and salt it, what it means to “spatchcock” and how to do it, what to put on the skin, how to use the drippings to make a gravy, as well as numerous other tips, tricks and ideas. Then come back here and we’ll tailor your cook to your kettle and Slow ‘N Sear. Brine: Salting the meat is a huge step that cannot be skipped. Salting obviously adds flavor, but it helps the meat hold onto more moisture as it cooks. Turkey breasts tend to be dry since the meat is so lean, so we want to make sure we give it all the help we can to be a juicy pleasing meal. Important: Look for the sodium content on the Nutrition Facts label. If the sodium content is 200mg or below, proceed with dry brining (discussed below). If it’s 300mg or higher, skip the dry brine. Especially if the package says it’s “enhanced”, “moisture enhanced”, “injected”, “basted”, or “self-basting”, make sure to check the sodium content before salting! “Basted”, “self-basting”, “enhanced”, etc. are terms that mean it’s been salted at the processing plant, and they can legally be injected with a salt and water solution of up to 9% or more of the turkey’s weight. Just how much of that 9% solution is salt, no one knows. This is why we recommend checking the sodium content on the label. Even if your bird is labeled “all natural” (as we see above) or “organic”, they could still be pre-salted, since after all salt & water are natural! If you find this to be the case in your supermarket, as many do, limit the dry brine or wet brine. 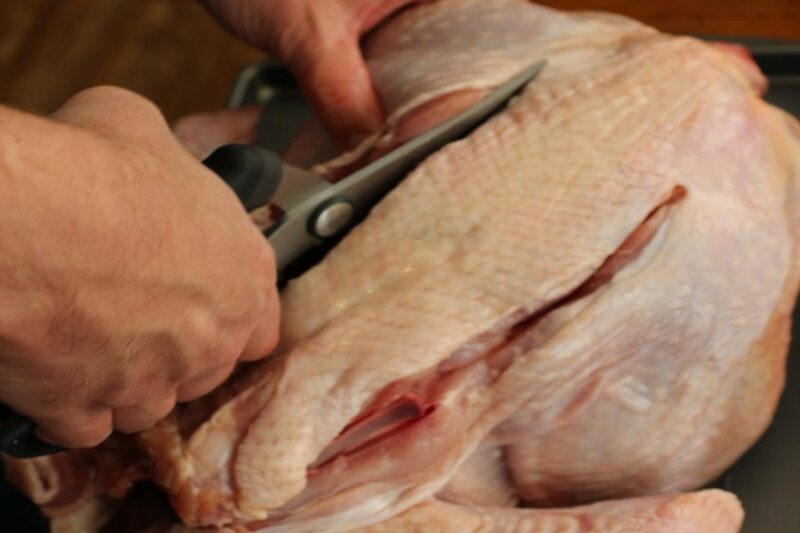 You can add some salt to the surface of the meat, but it’s best not to risk over-salting your turkey. Now, if we find a turkey that’s not been injected with a salt solution or has a sodium content under 200mg then we can proceed with a brine. We like to dry brine the bird generously, at least overnight if not 24 full hours. Dry brining is less messy, less wasteful, and just as effective. 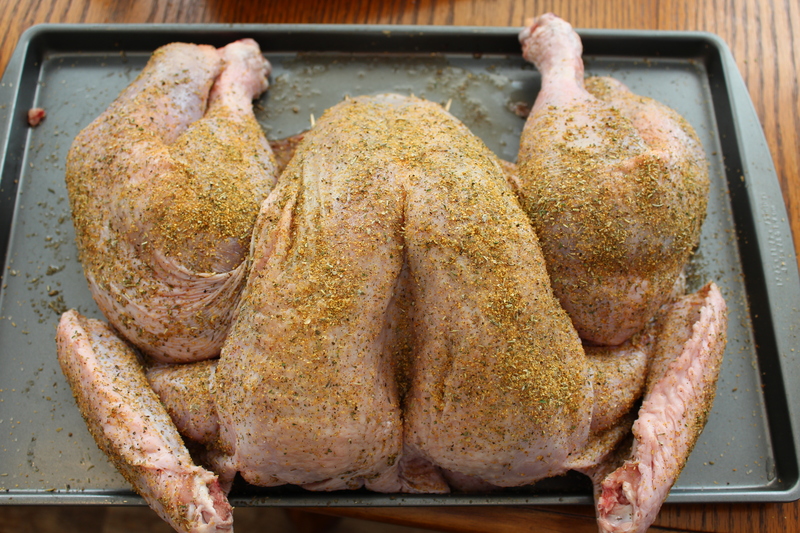 Cover the bird inside & out with up to ½ teaspoon of coarse Kosher salt per pound of meat. If you need a low sodium turkey cut that # at least in half. If your turkey is 12 pounds, this means you’ll use 6 full teaspoons of coarse Kosher salt spread evenly over the entire turkey inside and out. Create a safe zone in your fridge so there’s no cross-contamination. Let it sit in the refrigerator uncovered. This will aid in drying the skin and lead to a crispier final product. If you do not have access to coarse Kosher salt, you can use regular table salt, but use half the amount, ¼ teaspoon table salt per pound of meat. There is no harm in letting the turkey sit longer once dry brined. The salt you add to the surface of the meat is the only salt that will be in the meat. You could let it sit in the fridge for 2 days if you choose to. Watch for and prevent drips so as not to contaminate other foods. Setting on a rack in a pan to allow for airflow yet catch drips is a great way to dry brine in open refrigerator air safely. A wet brine is also an option, but can be more cumbersome with a large turkey. If you’d like to do a wet brine, we suggest a very simple & delicious poultry brine of 1 gallon fresh cold water, 1 cup table salt, and 1 cup white sugar. Stir to dissolve. Don’t worry about adding herbs to the wet brine, they will do nothing at this stage. We’ll add them later where they’ll actually do some good. Use enough liquid so that the turkey is submerged in the bucket or brining bag you choose. 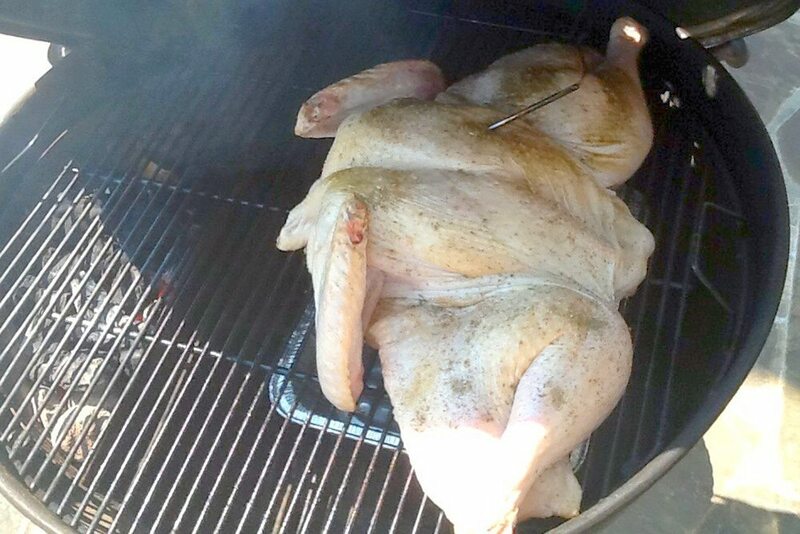 If only a little pokes out, just rotate the turkey every 30 minutes or so. If 1 gallon is just not enough, scale up by using the same proportions. Brine the turkey about 3 or 4 hours. We do not recommend you wet brine overnight. The longer it wet brines, the more salt it will pull out of the brine into the meat, and this can oversalt the turkey. Again, practicing will tell you exactly how you prefer it. 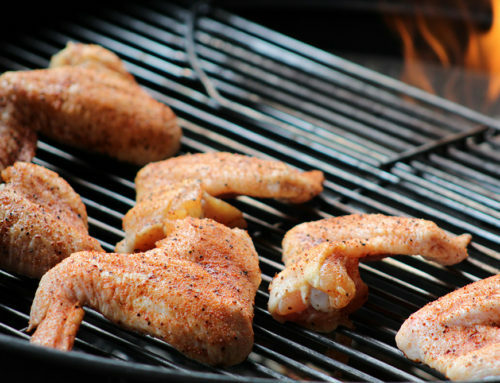 Season: A great seasoning blend for chicken or turkey is Meathead’s “Simon & Garfunkel” rub You can find it and more here at AmazingRibs.com. This is our go-to turkey rub. If you have your own favorite rub use that instead. Mix all ingredients in a bowl then add to a grinder/blender. Pulse the grinder/blender a few times until the ingredients are coarsely ground. Now, let’s apply all of your turkey cooking knowledge to your Slow ‘N Sear! As with chicken, turkey is best cooked hotter than your typical barbecue meats. Whether you intend to smoke the turkey or not, we will recommend to you a minimum cooking temp of 325° F. If your grate temp rises to 340° or even 350°, don’t be alarmed. 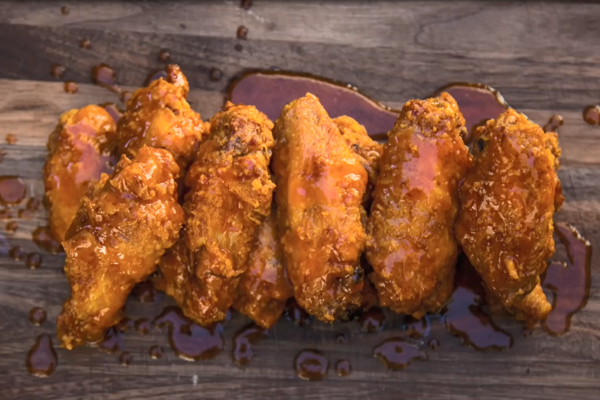 The hotter the cook, the crispier the skin and typically the juicier the meat. The skin can darken and shrink when cooked too hot though, so balance is necessary. We prefer chicken and turkey to cook in the area of 340° F, while maintaining a minimum of at least 325° F. Too much time over 350° F or 360° F can result in a less visually-appealing turkey, but the meat will still be delicious as long as the proper finishing temps are followed. To get to this optimal poultry temp with your Slow ‘N Sear, please refer to our hot & fast 325 F lighting technique. When spatchcocked (butterflied), the average 4-6 lb chicken takes from 75 to 90 minutes at a cooking temp of 330°-340° F. A turkey being bigger and thicker will naturally take longer, so expect about 2 hrs if the turkey is spatchcocked and fully thawed. Larger turkeys could even take 3-4 hrs. Most importantly, we cook to temp, not time. We recommend spatchcocking or butterflying the bird since this method allows even cooking on the inside and outside simultaneously and drastically reduces total cook time. A whole, intact, bird can still be cooked, but the time will increase as the interior cavity gets less heat and airflow. A spatchcocked turkey up to 20 lbs can be cooked on the 22” kettle in the indirect zone, and up to 30 lbs on a 26” kettle. It’s best if the turkey does not touch the walls of the kettle. If this is unavoidable, set the turkey so that the tips of the drumsticks touch the wall, but the meat of the turkey does not. 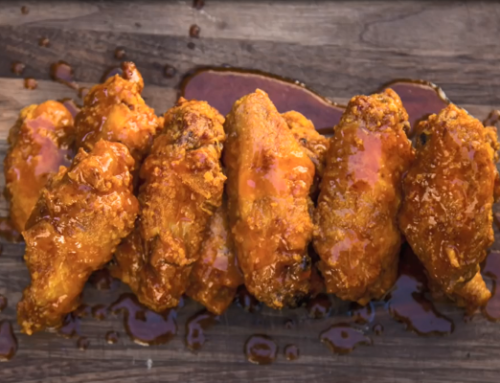 We also recommend wrapping small strips of foil about 1” around the tips of the drums and the wings to avoid them darkening too much and appearing burnt. Approximately 30 minutes before finishing, or when the breast temp is ~120°-130° F, remove the foil wrappings to let those areas darken up. The choice is yours on whether you want to add some wood to the charcoal basket of your Slow ‘N Sear. 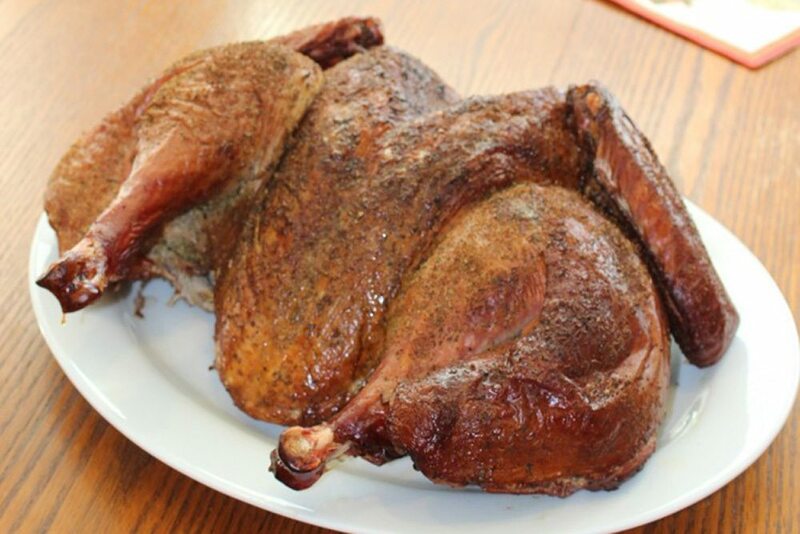 A truly smoked turkey is a grand departure from the classic oven-roasted turkey mom and grandma made in the past (and might be expecting from you!). 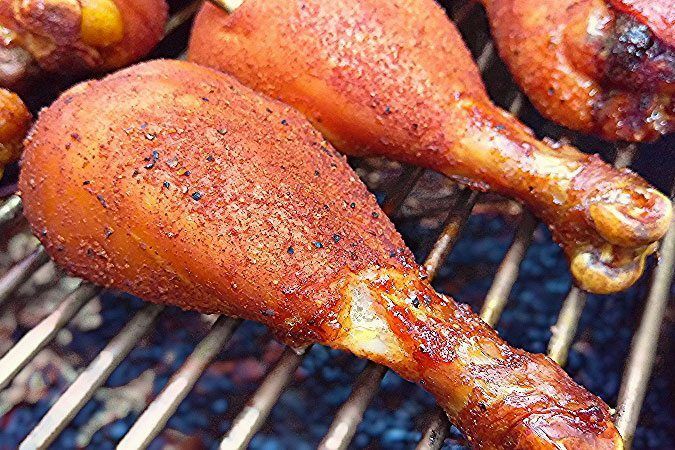 Poultry meat is a sponge for charcoal and wood smoke flavors. Often a woodless cook gets enough of that “grilled” character simply from the charcoal combustion gases. If you want to use wood though, go small. Try one small chunk, perhaps golf ball- or half a candy bar-sized, and that’s it. This will be enough to add a kiss of smoke to the turkey without it overpowering the classic turkey flavor most folks will be expecting. If you practice ahead of time on a chicken or a turkey, then you will get a firm idea on whether or not this suits your palate. Remember, it’s good to consider what your dinner guests will be expecting too. Maybe they don’t want a smoked bird, or maybe they’ll sing your praises if you serve them one. 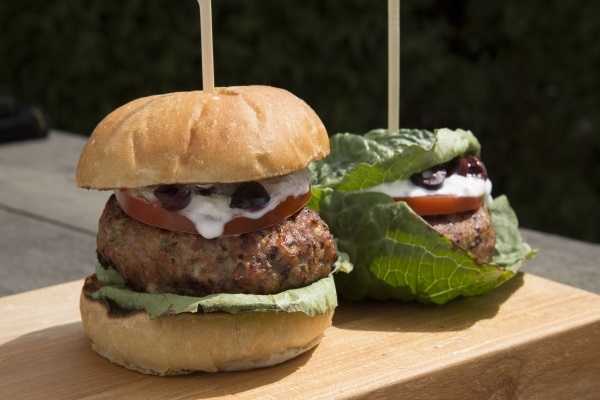 That choice is yours; either way it’s going to be tender and juicy – you can’t go wrong! The water reservoir is important mainly for long low & slow cooks, such as ribs, brisket, etc. It helps to stabilize temperatures and adds humidity to the cooking environment. For a hotter faster poultry cook, it’s simply not necessary. You can skip it. An empty water reservoir will still create a thermal barrier and help separate indirect from direct zones. 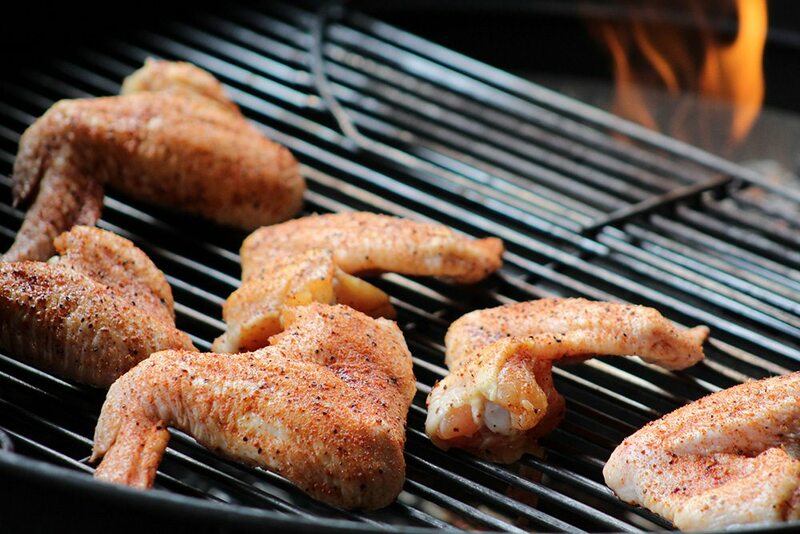 As with chicken, be sure to take the breast meat to ~155°-160° F, in the coolest, deepest part of the breast. But wait, you thought 165° F was the safe temp for poultry? Yes, sort of. The USDA Food Safety and Inspection Service in this article recommends a minimum internal temp of poultry to be 165° F, which is in effect the “instant kill” temp for poultry microbes. However as the chart shows, as long as the meat stays at 160° F for 27 seconds, or even 155° F if held there for 1.3 minutes, it’s safe. We recommend pulling the turkey off the cooker when it hits between 155° F and 160° F in the coolest part of the breast, since it’s a slow rise to get it there and carryover cooking will hold the meat there for plenty of time after it’s removed from the grill, perhaps even allowing it to rise a couple degrees further. You likely already have a good quality digital meat thermometer if you’ve been grilling and smoking prior to doing a turkey. If not, it’s mandatory you get one. DO NOT rely on the pop-up thermometers that come with your turkey, in fact just throw it away. Pop-up plastic turkey thermometers are set to pop at an average temp of 180° F. Your breast meat will be dry cardboard at this temp! Please, for the sake of everyone at your table, use a good digital thermometer! You will prevent everyone from getting ill, or chewing on dry overcooked meat. We like to use the wireless dual-probe Maverick ET 732 or the quad-probe, extended range Maverick XR-50 (that we co-developed!) but there are many similar ones to choose from. With a wireless dual- or quad-probe thermometer, you can use one probe to monitor the grate temp where the turkey sits and one probe to monitor the temp of one or more pieces of meat. You can set alarms then go inside to visit with friends and family while your thermometer keeps you informed of your exact cooking temps – no guesswork, no hassle. Another recommendation is to use an instant-read thermometer such as the Maverick PT-55. Then, when the breast leave-in probe reads 155° – 160° F you can use the instant read to spot-check other parts, or the other breast, to be sure the turkey is at a safe temp everywhere, but not overcooked anywhere! When the breasts reach 155° – 160° F, the other parts of the turkey (legs, thighs, wings) will be higher in temp, closer to 175° F perhaps, and this is ok. 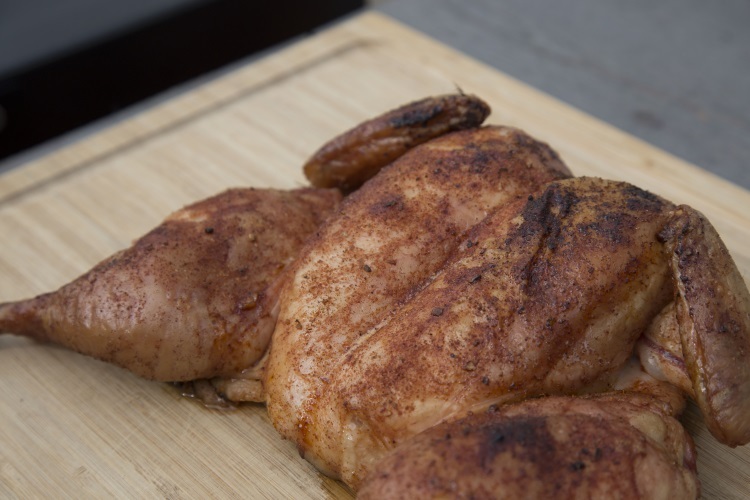 Dark meat can stand a much higher internal temperature and still remain palatable. 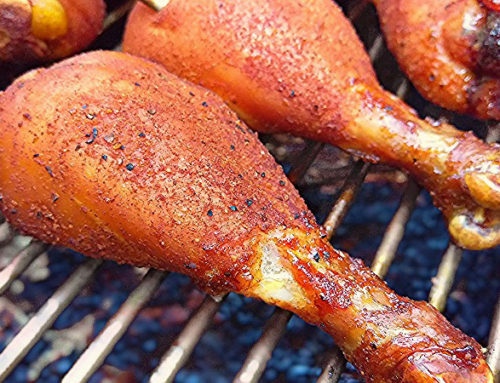 In fact, dark meat taken just up to the safe temp of 160° -165° F can still have an unappetizing slimy texture, so it actually benefits from a higher finished temp. A spatchcocked/butterflied turkey may not have the same tray appeal as a classically cooked whole turkey, but that can more than be made up for with the flavor and texture. Slice the meat up, leaving skin on the slices where possible. Do it while it’s hot, serve promptly and do not cover or ‘tent’ the meat with foil. Covering or tenting will cause steam to build up and soften that crispy skin we’ve worked so hard to achieve. If you insist on a classic turkey presentation, it can be folded back into position and placed on a serving platter, garnished if desired. Sometimes the skin will be a little less brown in areas where the skin was touching during cooking. To help eliminate these “tan lines”, the turkey can be folded back into the classic whole turkey form about the time you’d remove the foil strips from the legs and wing tips, roughly a half hour or so from finishing time. 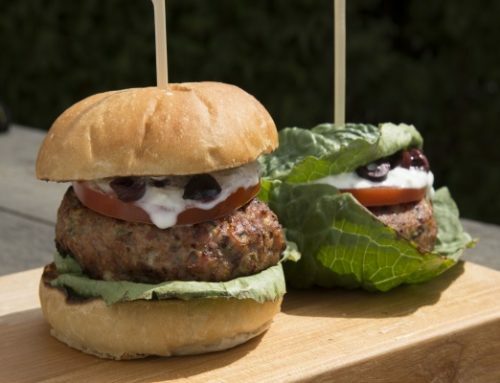 It might be tough, since that meat has now settled into its current shape during cooking, but it’s possible if you’re looking for a classic presentation. We agree. By the time the deepest part of the breast meat reaches 160, the dark meat will likely be 175-180. We mention this in the recipe. Do you have to cover the breast to give the dark meat a head start. OMG!! Did one yesterday per above instructions and what a success. 18# bird took 3 hours. Pulled it at an IT of 160. Love my Slow N Sear. In the video it is injected with butter. But I don’t see anything written about that on this page. Do you inject? How much? All over or just breast? It’s optional. In the AmazingRibs.com recipe that we used in the video, they do inject with butter. Just the breast as that’s the meat that’s more likely to dry out during the cook. We started with about a 1/2 cup of melted, unsalted butter. The amount you use will depend on the size of the bird. With this cook, there was still butter remaining that didn’t get injected into the turkey.